Stephen Hebscher and Bruce Karten are recognized as two of the most prominent and respected Brampton Criminal Lawyers, practicing as ‘The Criminal Law Team’. They bring over 60 years of experience to their law practice. 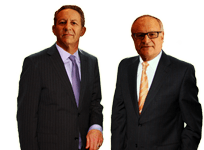 Bruce and Stephen each have their own roster of clients, however, every client benefits from the experience of both these distinguished lawyers. They work together on cases to bring their combined knowledge to the table on behalf of each of their clients. Our primary goal is to successfully defend our clients, and this has been revealed by the outstanding history of results we have achieved on behalf of the clients we’ve represented, many of whom have never received a criminal record nor seen any jail time. We provide a vigorous defence for our clients, but most importantly, we support them through what is often a very difficult and emotional time. As a team, we are results-oriented, and strive to make the process of navigating our clients through the criminal justice system as easy and stress-free as possible. From the first meeting, you will feel at ease and confident that you are leaving your case in the hands of two accomplished Brampton Criminal Lawyers.